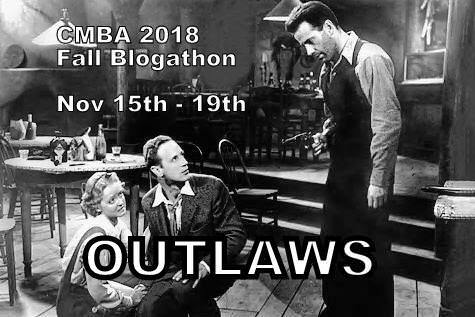 STARDUST AND SHADOWS takes a brief break from our content to offer an opinion on the troubled institution for film fans which, of course, is the Academy Awards. Unless you live some place where there is no news or frankly you really “don’t give a damn” you would know that the Academy Awards are having a poor go in the media. Is this really the case? Yes,it is. As I see it, it is symptom of a large issue of audience apathy and lack of change. This may seem like the grumblings of a grumpy old man about young people not being “cinefiles,” yet he is essentially correct. You should not have to study film to enjoy it or know the history of every studio or star but it helps enrich the experience. Some people do not care. Movies are entertainment to laugh, yell, and leave when the end credits are running while wearing their coats that they don’t take off. The market for film is world wide and delivered on all sorts of different platforms, from streaming sites to specialty channels to cinema houses and festivals. You will get people watching that are interested, however, when the availability is open more you get those that are not. The difficulty is when those that are not somewhat discriminatory in viewing begin to dominate which translates into blind acceptance. Film has created this market: huge cash cow. Yet it doesn’t know how to deal with it. How does this effect the Academy Awards? Well, it creates the “fire storms” that make the awards not worth watching for some people. The awards themselves don’t do themselves favors as the show has become a three hour plus attempt to legitimize ourselves presentation designed to show off designer clothes, jewelry and pump new releases with trailers on television. It now caters to the cash cow audience that Hollywood has created. The art of acting is reduced to reacting to CGI effects or being under piles of make up because the behemoth audience requires this kind of engagement. Hollywood has made the intimate drama of two people say of more with a meteor coming to destroy them nothing less then an Art House film which alienates those that don”t care. 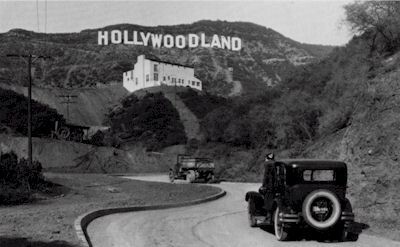 We speak of lost Hollywoods. This isn’t yesterday. It is the rapidly accelerating today so we need to make change at all levels. Many don’t watch classic film because it’s in black and white. Many don’t watch foreign films or silent pictures because they don’t want to read their movies. These are all symptoms of what Hollywood created when its made that not caring cash cow audience. Solutions to this would be a long and hard road. Hollywood has created a generation or more of audience by not seeing what is around them and not evolving the product. We need to lift this archaic content and viewing restrictions that some countries have. Film is world wide; not just one country although it seems the American model (meaning Hollywood) dominates. It’s a new version of an old problem of the major studios owning the theaters and block booking, except it’s not just the neighborhood that’s up for grabs. The beautiful part of this is that somewhere someone will see the product on a new platform and be inspired to become a film maker in some capacity. We needed to make this accessible by not having so many restrictions or centralized production. Production companies really do not listen to people even when they say they do or open large creative centers. We need to make small films more visible and eligible for an award of some type. We need to foster stronger acting values with real training in accent, body, with tangible roles and situations that challenge . I will be watching the awards tonight not because I am not a cinefile but because I do care about this story telling medium that is in trouble. I do still believe in the magic time of the Stardust and Shadows. 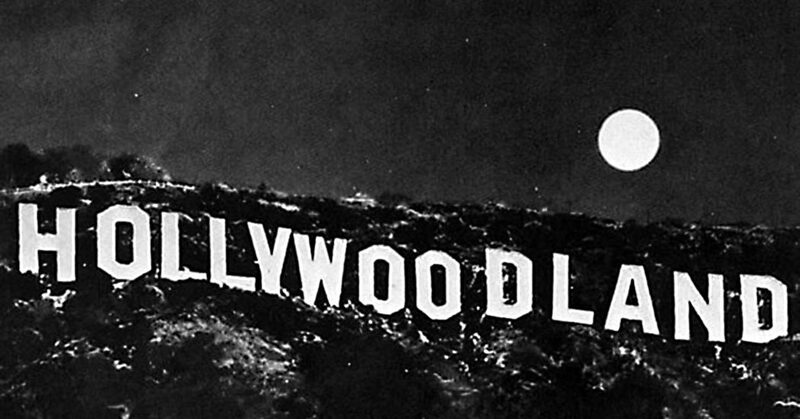 The dowager that is Hollywood survives. Some films don’t sit in areas of style or content that fit a particular genre. 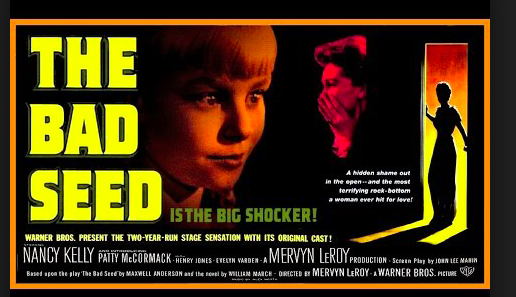 THE BAD SEED (1956) is thought to be Horror film, a Film Noir or a thriller. Where it fits in the canon is not important only that it is a strong film yet not to everyone’s taste. 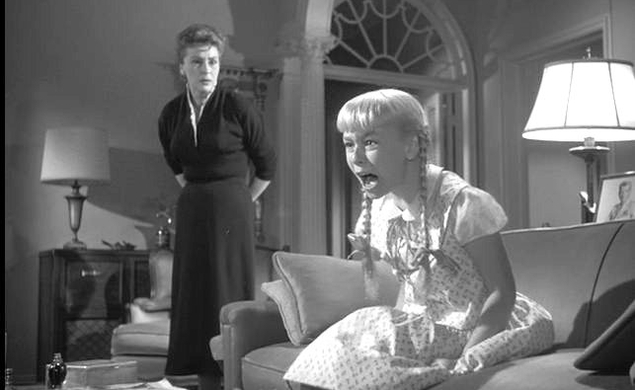 THE BAD SEED (1956) fits right along with WHATEVER HAPPENED TO BABY JANE (1962) and HUSH HUSH SWEET CHARLOTTE (1964) as a story of urban terror. 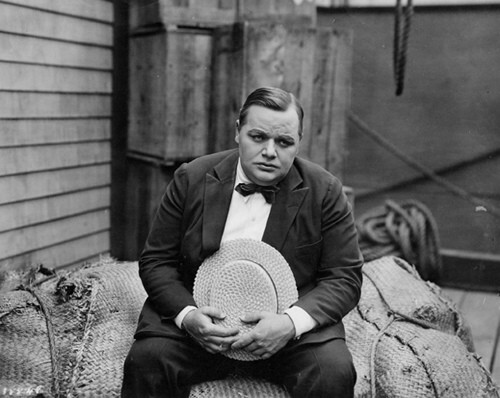 The Warner Brothers picture came from a Maxwell Anderson play from a novel by William March. 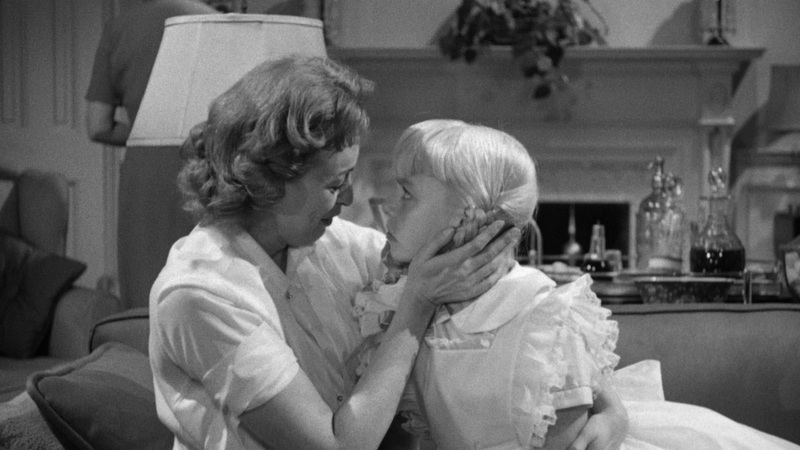 Shot in moody black and white which still packs a punch for stories of this nature THE BAD SEED became one of the biggest hits of 1956. You can have a good story, good images but if the actors and Director and other personal make poor choices then the film can be a missed opportunity this is not the case. 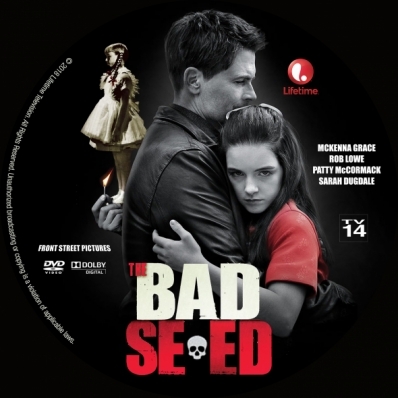 THE BAD SEED shines from the moment it opens with the quirky music mixing child rhythms and simple piano melodies which will become important later on by Composer Alex North. 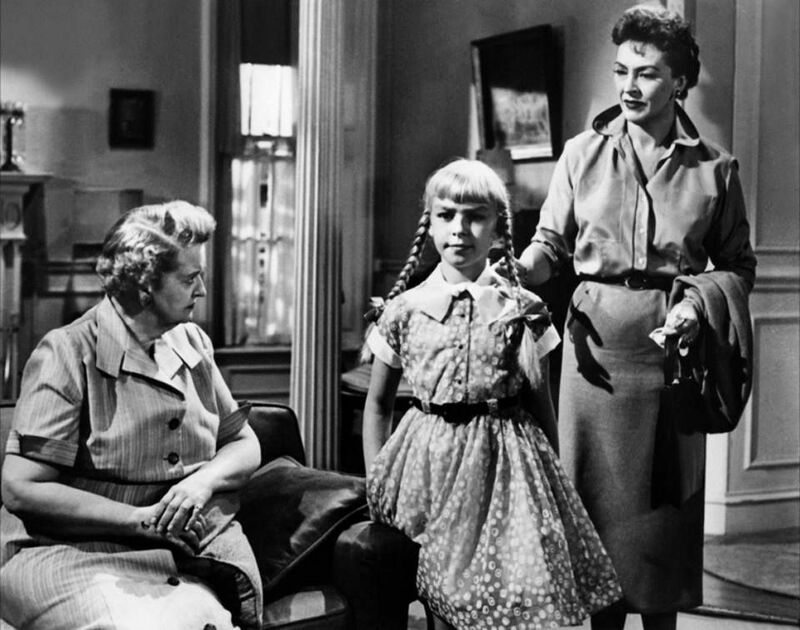 The star of the show is Patty McCormick as the eight year old Rhoda Penmark who is doted on by here parents Christine Penmark (Nancy Kelly) and Col Kenneth Penmark (WillIam Hopper). The love expressed is sickly in nature with platitudes of ‘doing no wrong’ and ‘The perfect child’ gushing out as Col Hopper is leaving on a work trip. 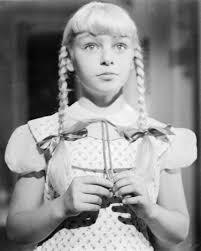 McCormick uses a high pitched voice to utter her ‘Daddie’s’ and ‘Mommie’s while all dressed in “Pippi Longstocking’ braids and little dresses. Christine doesn’t look like a child of the fifties but a strange Doll contrivance reminiscent of the use of a other Doll in WHATEVER HAPPENED TO BABY JANE (1962) . Nancy Kelly as her mother Christine is high strung herself yet doting on her Daughters whims. She tries to be a firm parent in tone at times yet looses the point of her talk when the master manipulation begins by Rhoda. She desperately wants her husband to stay but Military work calls him away so he must go. They have a strong marriage bordering of desperation on Christine’s part as shown when they kiss almost frantically as the Colonel is leaving. One senses this is a wife and a mother on edge of what we do not as yet know. Evelyn Varden plays Monica Breedlove who is a sort of nanny/ companion to both Christine and Rhoda. Breedlove is forever complimenting Rhoda on her perfect she is when she curtsy’s when guests arrive is always saccharine polite. 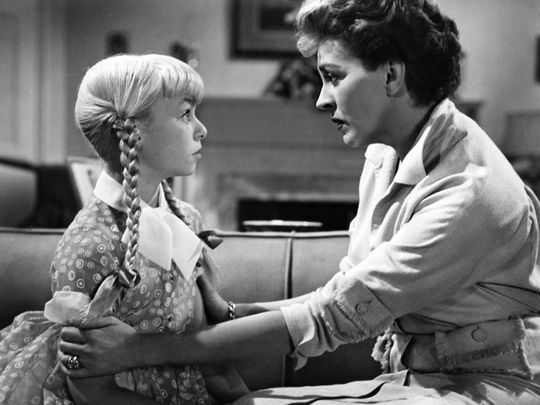 She tells Rhoda that she should have won the Penmanship medallion which was given to a classmate Claude Daigle as she was the best at her school only the others didn’t see it. Rhoda is disappointed deeply yet the anger and temper simmers just below the surface as her expression darkens. This not a childish disappointment to be gotten over by gifts or ice cream. 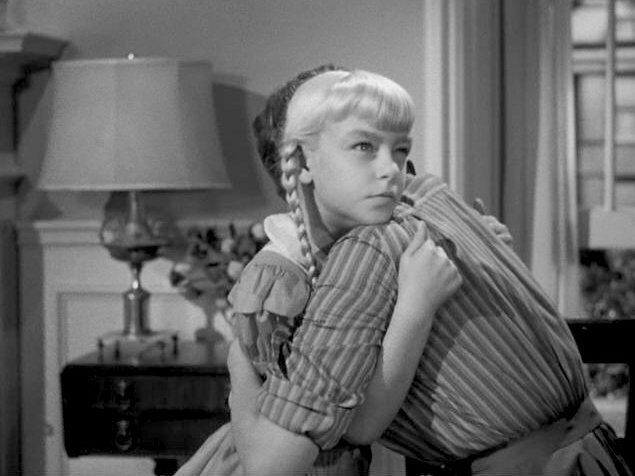 There is something behind Rhoda’s eyes when she hugs you see her expression switch to something malevolent when not visible then back again to sweet when she is seen. Rhoda entertains herself by taking the covers the soft heel covers off a pair of shoes to create tap dancing boots so she can click on the wooden floor much to her personal glee. Rhoda and her mother leave for a picnic and nearby park with her school friends. Later when back at home Christina and Monica her a radio News report that a yet un identified child has drown at a nearby park lake. This throws the home into panick as everyone thinks it is Rhoda but child is identified as Claude Daigle; the boy who won the prize. It is also said that he had several abrasions on his face and head thought to bruising from the water knocking him into the wharf. 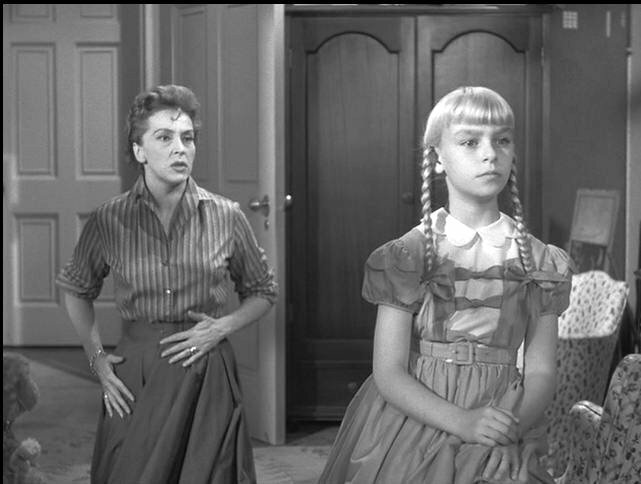 Christine is also worried that Rhoda will be traumatized as she saw the child’s corpse. Rhoda’s teacher Mrs Fern (Joan Croyden) visits saying that Rhoda was last person to see Claude alive and was seen grabbing at his metal which would indicate a connection yet she stops short of accusation. The story becomes darker as connections are made and Rhoda’s deep psychosis comes to the surface yet always unpinned by the smile. Christine finds Claude’s penmanship medallion in Rhoda’s jewelery box and demands to know how she got it. Rhodas cajoles her even to the point of physically stroking her mothers next cooing that she ‘has the best Mommie in the world and the best family’ in an act similar to a master petting an animal. Christina makes desperate calls to her husband yet he cannot get away from his duties but will try. Christina also goes through the revelation of a horrid family secret by her father Author Richard Bravo (Paul Fix) who comes to visit and see his grand daughter. Christine finds her own origin in terms of a parental confession is not what she thought it was but something entirely different that has unleashed something beyond her control. Jessie White as Emory Wages and Gage Clark as Reg Tasker round out the family friends all thinking that Rhoda is the perfect child. 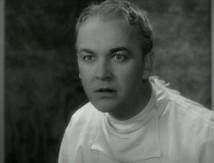 Special mention to actor Henry Jones as the slow, dimwitted gardner/ handyman LeRoy Jessup. 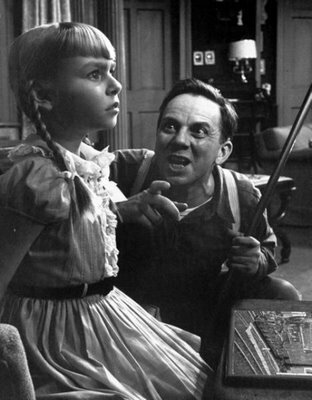 Jones in the best role I have seen him play shines as the only person who sees Rhoda for what she is and enjoys what he sees. Jessup calls her at one point ‘Mean’ which is okay for him as he is ‘Mean’ as well. 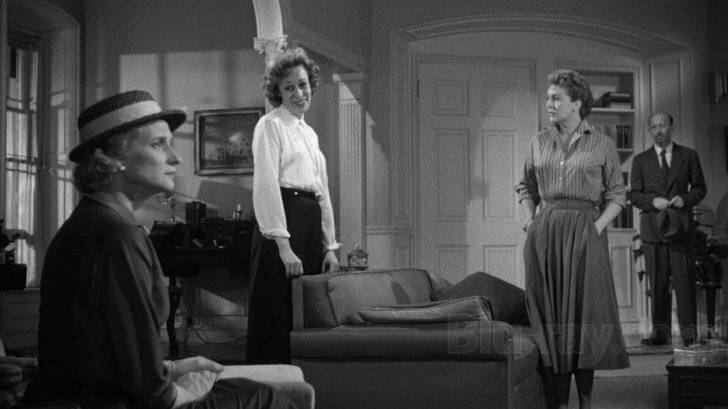 Jessup taunts her with the fact he knows what she is thinking particularly in a wonderful moment as the two exchange vicious barbs while Rhoda is having a imaginary tea party outside with a gift she got from her father. Rhoda tosses him some straw packing material from her gift for his bed which is located in house basement next the furnace. Jessup knows all about Rhoda before anyone else does as he taunts her about her shoes with hard soles which will become important. Revelations grow culminating in a shocking abrupt moment similar to NIGHT MOTHER (1986) which was also a play and a film. The evil will be avenged by something greater than us all even if it contains a ‘curtain call’ credit sequence meant to restore reality. 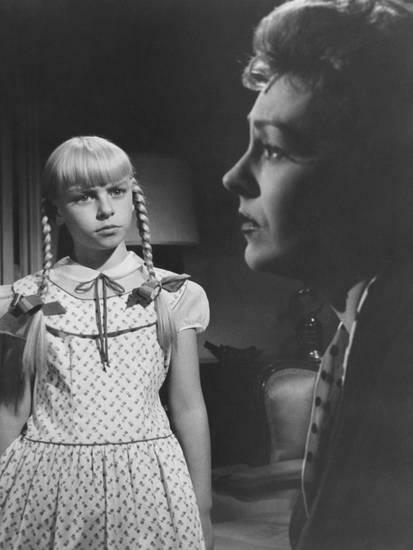 THE BAD SEED was remade for television in 1985 and was poorly received only to be remade again in 2018 with Rob Lowe directing. 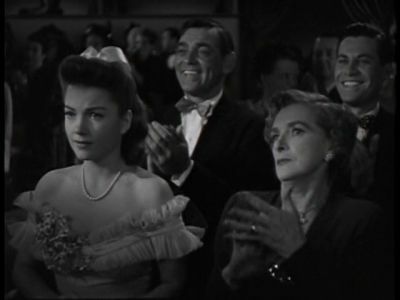 Patty McCormick takes bow as Doctor March in the film. 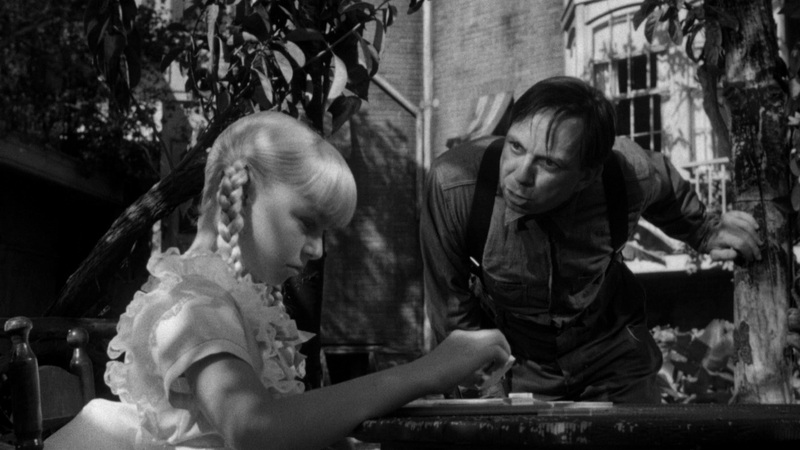 THE BAD SEED (1956) features a wonderful ensemble and creative team that brings this story that appears simple on the surface yet grows more insidious. You may notice that some of actor blocking and movement is theatrical in nature. You watch the disintegration of a family and a change of values for all. True today we never really know what really goes on behind someone’s eyes. Film is primarily story telling and entertainment and nothing brought a generation of children and sometimes adults back to the theater then the Serials. Those deeds of daring do taking place in jungles, lost cities, Outer Space, a frontier town, to under the sea by groups of kids in a gang or a solitary figure be it Hero or intrepid reporter, lion trainer, detective , military officer or in this case an visitor from another planet. 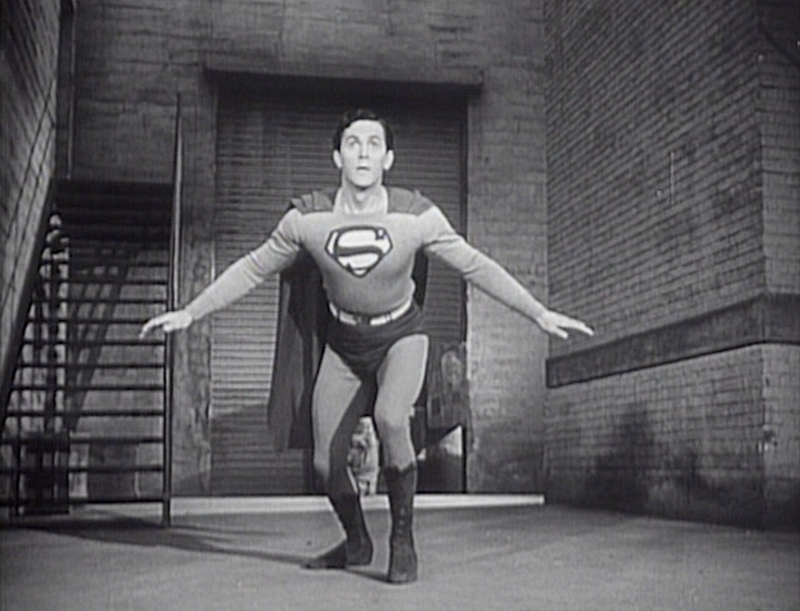 The high flying adventures of Superman were a natural fit for kids all ages and the movies. 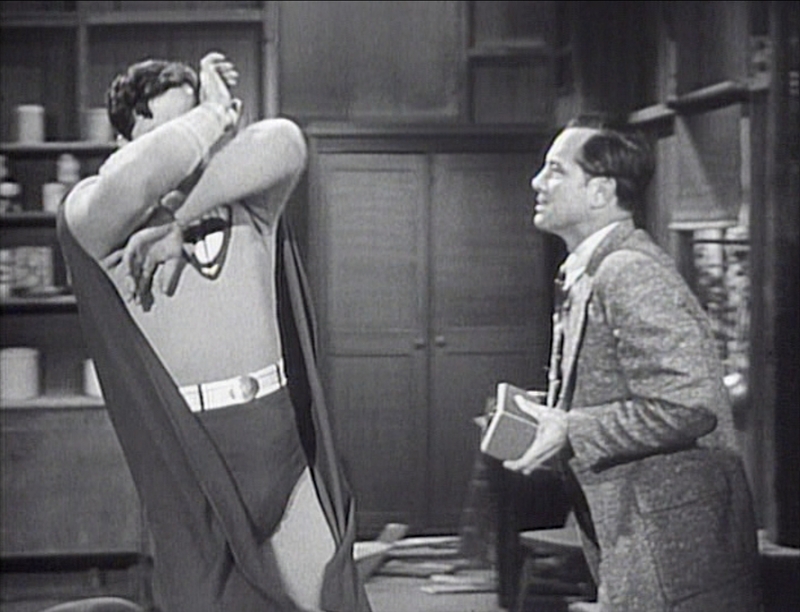 The fifteen part Columbia produced serial SUPERMAN (1948) featured actor Kirk Alynn in the title role. 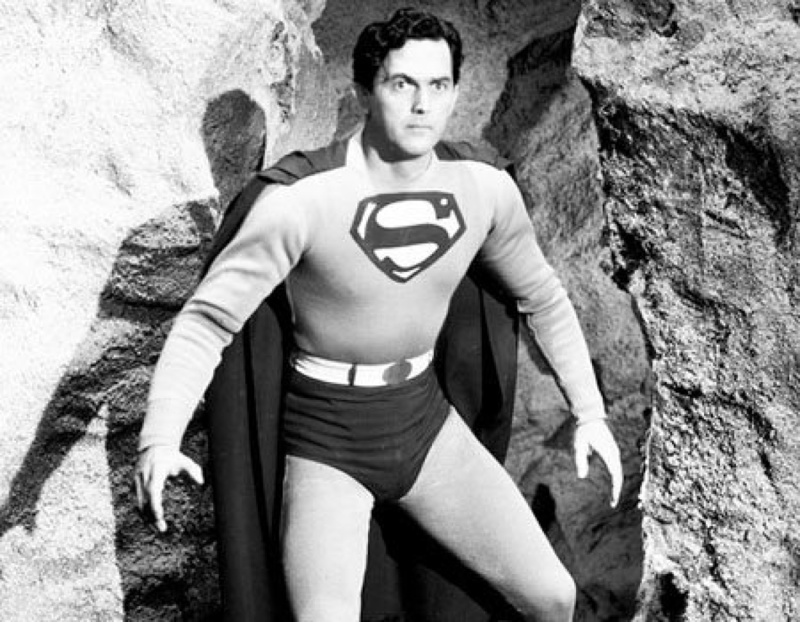 Mr Alyn who’s real name was John Feggo Jr, is the first to play the live action MAN OF STEEL predating George Reeves on the television series from 1951 to 1958. It was the first time the audience saw in ‘real life’ Jimmy Olsen, Perry White and Lois Lane. 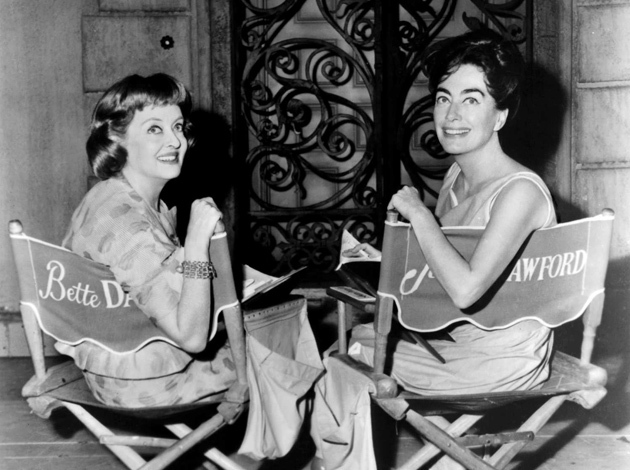 The serial was Directed by Thomas Carr who later also worked on some of the initial television shows. The style was naturally slam band with quick cuts, little dialogue, lots of stunts and the cliff hanger ending bringing the audience back. 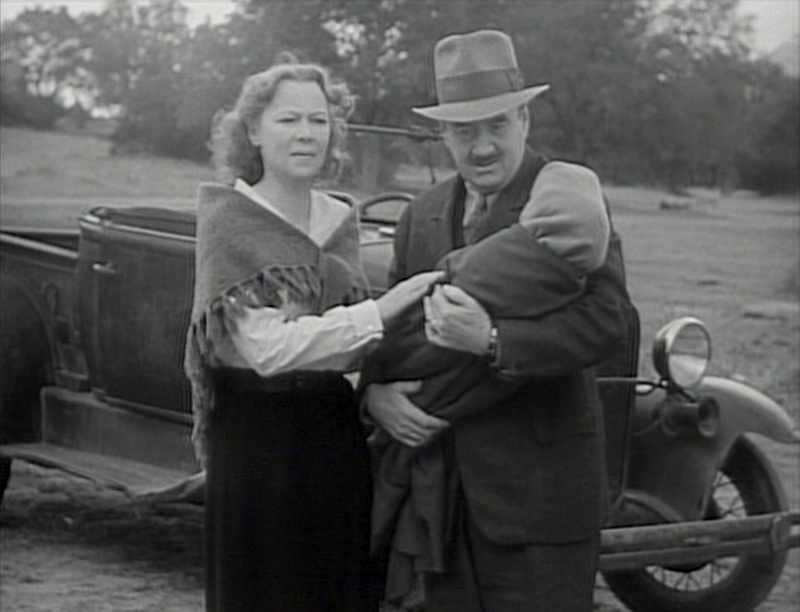 SUPERMAN (1948) gives us a first glance at the origin and arrival on Earth and adoption by the Kents who find him when driving home. This sequences in the first episode called SUPERMAN COMES TO EARTH is very reminiscent of Glenn Ford/ Phyllis Thaxter finding scene in SUPERMAN (1978) with almost the same style of vehicle and folksy humor. Kudos goes out to the film makers if that was a homage. 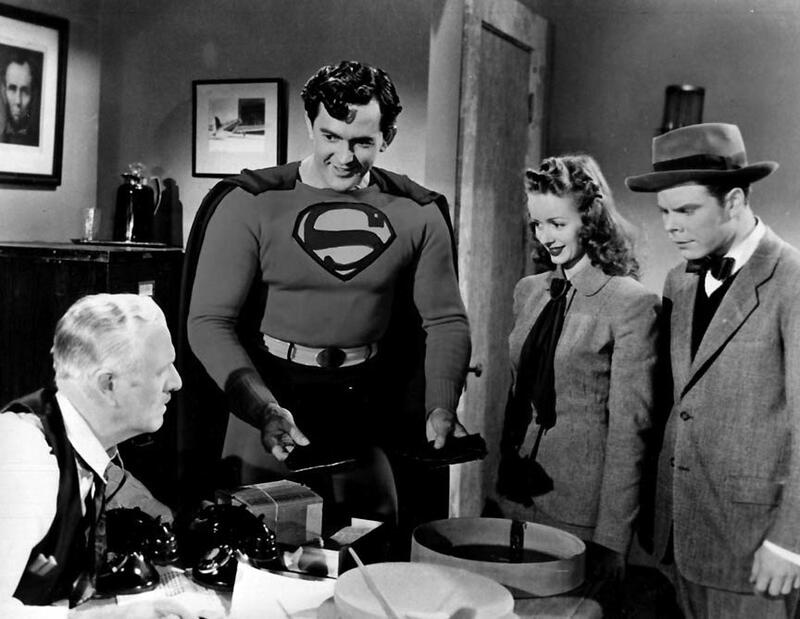 The cast also features the first live action Lois lane in the person of Noel Neill. Neill was a former pinup model during the Second World War second only to Betty Grable. 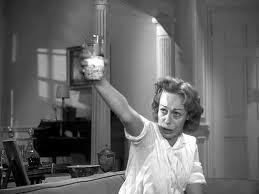 She was a regular in Monogram Studios and Republic Pictures usually playing women in Distress. he also sang with Bing Crosby and performed regularly at his club. It has been said that Lois lane was based partly on Torchy Blane character from the film series from 1937 to 1939. 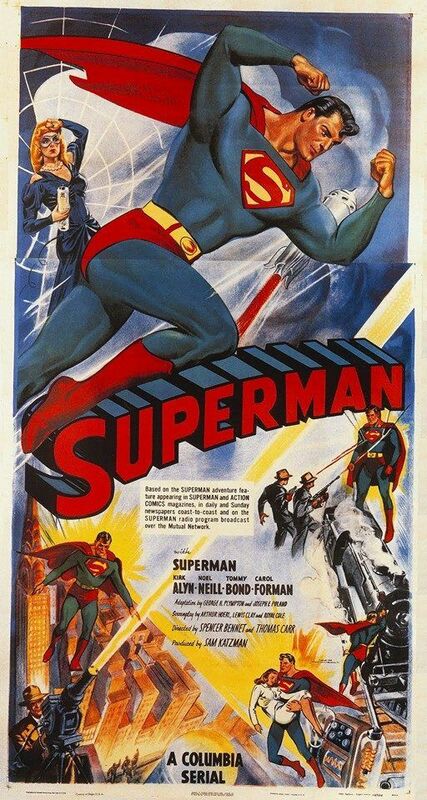 Neill was ‘Lois Lane’ in the follow up feature film with Kirk Alyn titled ATOM MAN VS SUPERMAN (1950) . 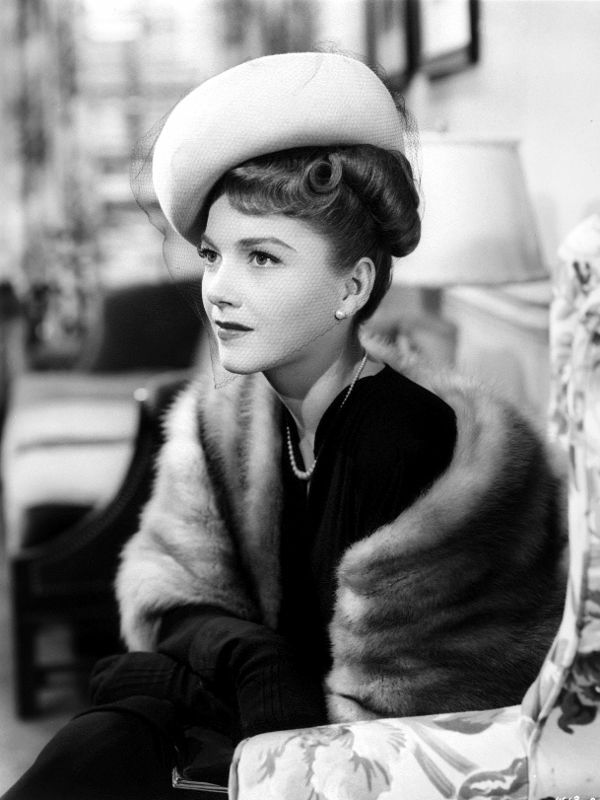 Neill was so identified with the role that she took over the part from Phyllis Coates after the first year of the George Reeves series due to Coates committing to another project. Neill went on to be associated with SUPERMAN by appearing in retrospectives. 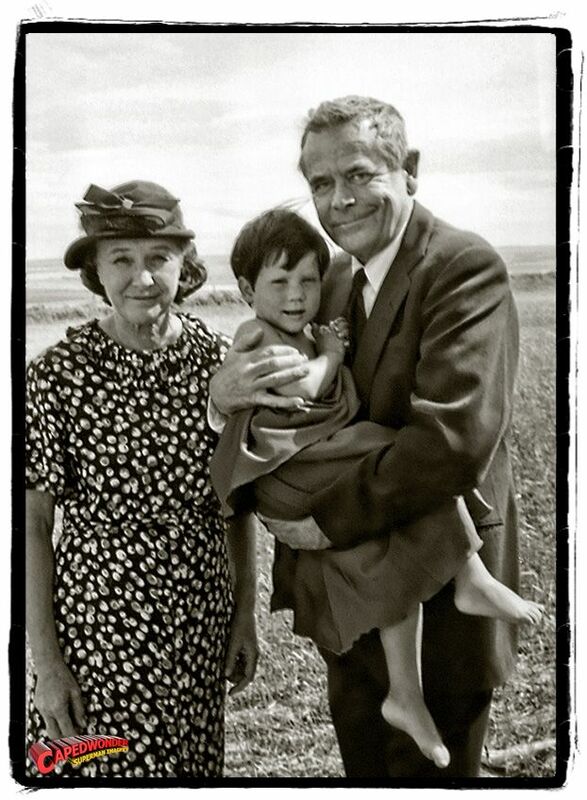 Both her and Kirk Alyn played Lois lanes’s mother Ellen on screen along with Alyn as Sam Lane in SUPERMAN (1978). Phyllis Coates would play Ella in LOIS AND CLARK: THE NEW ADVENTURES OF SUPERMAN Television series. While Coates initially distanced herself from the role . Neill embraced it by giving talks on college campuses, attending conventions which endeared herself to people with her warmth and good humor. A statue of “Lois lane’ in the likeness of Neill’s character was unveiled by her in Southern Illinois city of Metropolis in 2010 as a lasting legacy. The rights to the character were obtained by Sam Katzman who would go on the produce two Elvis Presley films and one by the English pop group Herman’s Hermits. The rights were difficult to get at the time because Superman was huge with the Comic audience plus he was only ten years since first appearing in ACTION COMICS issue number one in 1938. Bob Kane/ Bill Finger creation Batman appeared in DETECTIVE COMICS issue twenty seven in 1939. Batman had already appeared in live action format in the 1941 serial BATMAN and BATMAN AND ROBIN (1949). 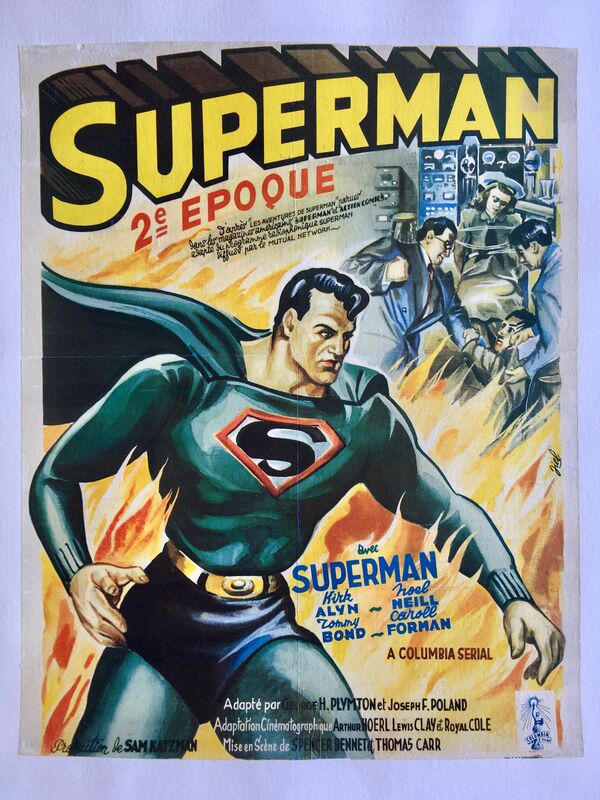 Superman was more demanding character as one was dealing with heat rays, super breath, super strength and of course flying on screen. First National Comics which later became DC wanted full control of the story hence negotiations were slow due to the later Classic Max Fleisher Cartoon series sold to Paramount. Katzman tried to sell the property to Universal Studios but they had stopped making serials Republic Pictures refused as it was thought the “Flying” was impossible to duplicate on a budget so the deal was made at Columbia Pictures. The picture had many writers including which was pretty much they way series worked. 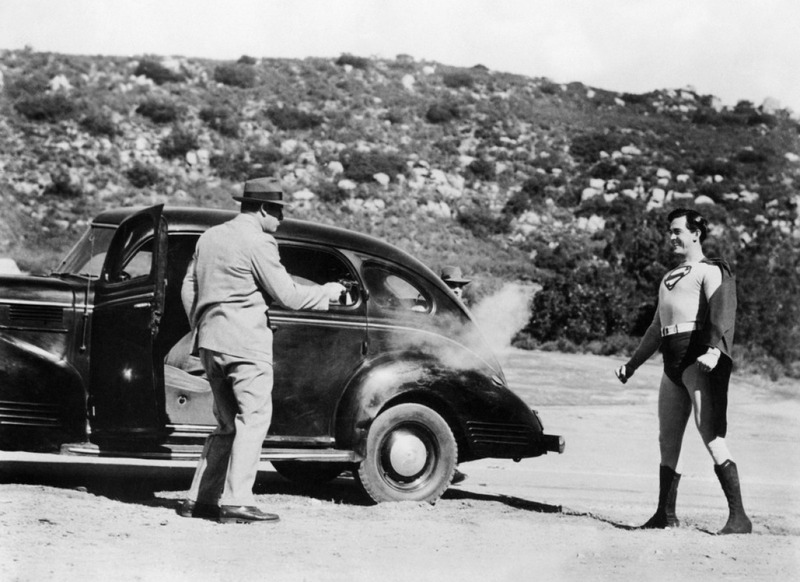 SUPERMAN(1948) concerns the Spider lady (Carol Forman)and her gang getting control of the Reducer ray. The gang also discovers Kryptonite at the effect it has on the MAN OF STEEL. 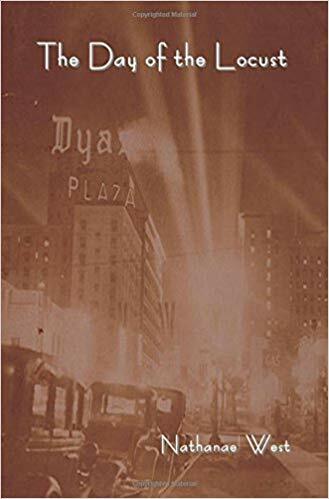 Plenty of car wrecks, Jimmy Olsen (Tommy Bond)heading to fiery doom of a blast furnace, Runaway trains, bullets bouncing off people and crappy Perry White (Pierre Wadkin) growling as he sends Clark and Lois on assignments that prove dangerous. Alyn tends to strike poses almost to the point of caricature but he makes up for it with strong look and voice of Clark Kent that would set the visual standard for all that followed. The stunts range from holding a running automobile, going into fire, x ray vision and bending railroad tracks which must have been pretty cool to see. Alyn’s fighting usually was him tossing around the actors ending with Superman holding up two of them and knocking their heads together. 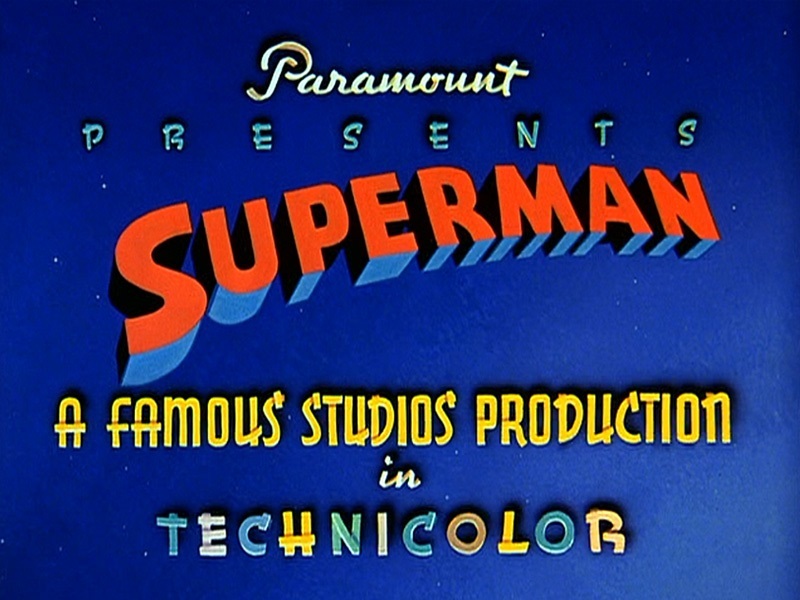 SUPERMAN (1948) was originally presented as a Saturday matinee yet after the first three episodes it proved so popular it played in “first run” movie houses that had never booked serial It proved to be a “tremendous financial success” for the studio and for Sam Katzman. The serial also made stars out of both Kirk Alyn and Noel Neill as both went onto the other things all be it similar. Thee series now is available for viewing while dated in approach and budget it still has strong genre writing and good old fashioned slam bang, gangster shoot em up entertainment. Movies can still be fun so its onward to another 80 years or more of SUPERMAN. Today we need Heros even more. Firstly let me say i have weakness for these so called ‘Women’s pictures’ which became a genre in of their own. 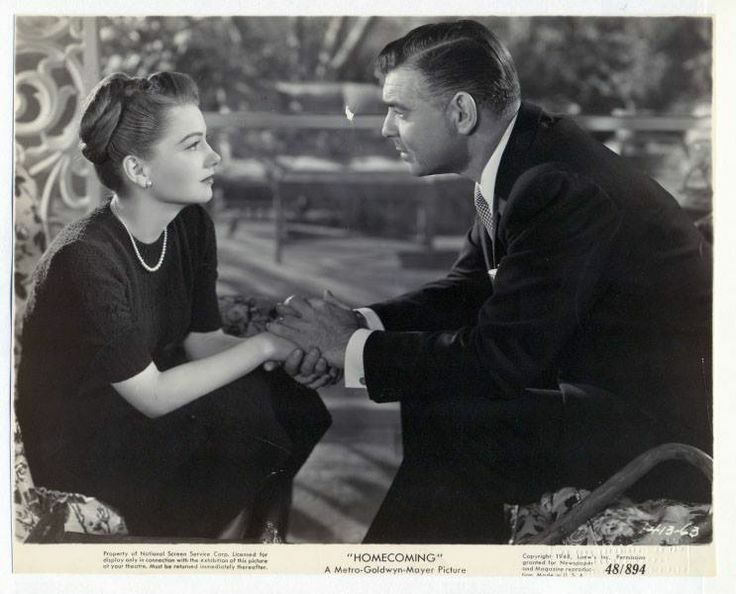 I was skeptical of HOMECOMING (1948) since it was a later career Clark Gable picture and I read in some biographies of how he disliked the material he received. In this instance both Clark and Lana received a gem. 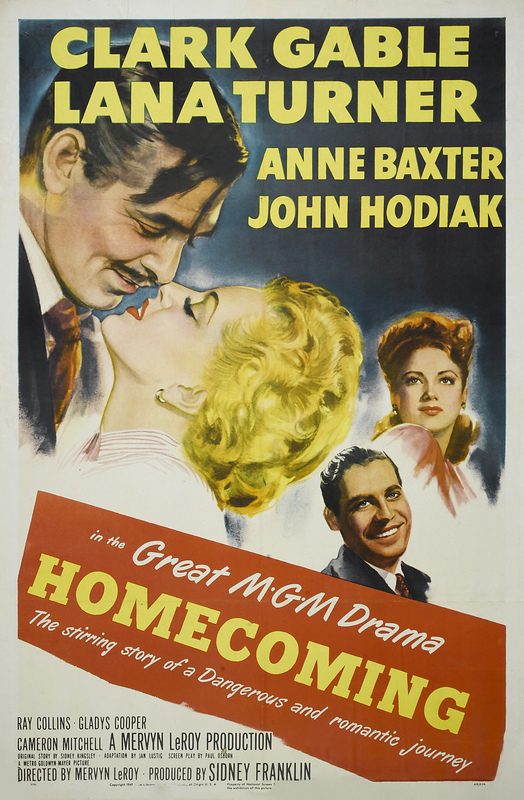 HOMECOMING (1948) was Directed by Mervyn Leroy from the same studio that gave us the quintessential Hollywood coming home war picture of the forties: MGM’s THE BEST YEARS OF OUR LIVES (1946). Hollywood had a market now for this style of picture with real drama occurring during the demobilization of all countries. 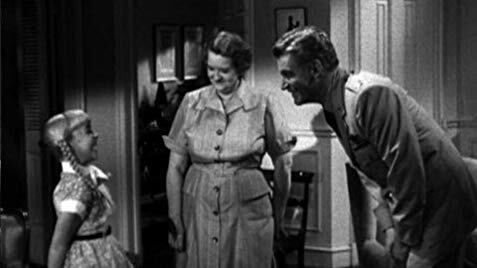 MGM had capitalized on the war story of Girl/boy find each other and part because of shipping out as shown by the roles of Van Johnson as the “fresh faced” soldier to the female cast next to him to the brilliant Judy Garland/ Robert Walker picture THE CLOCK (1945). What makes all those films and indeed what makes any picture of that scope work for me is the story and the ensemble that executes it. 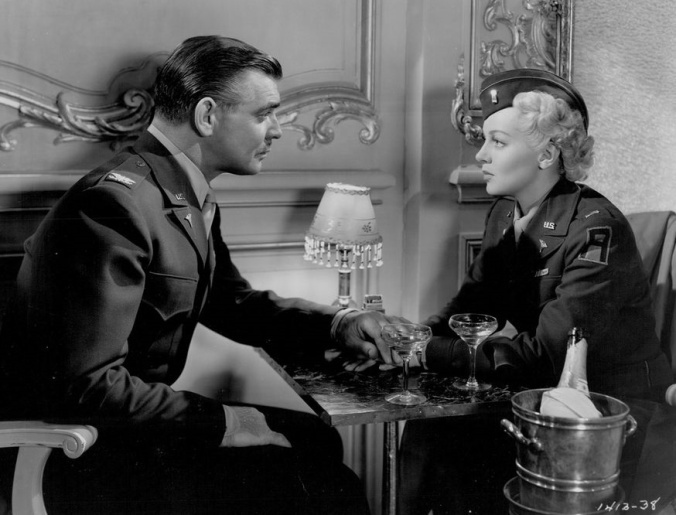 HOMECOMING (1948) was one of the first roles Clark Gable was assigned to after the death of Carole Lombard in plane crash in 1942. 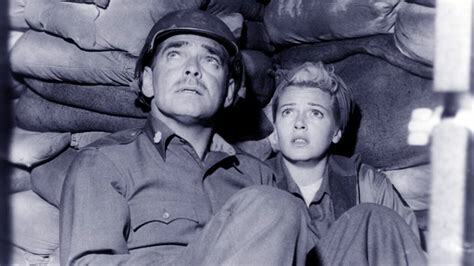 The first being ADVENTURE (1945) which was touted in the poster that GABLE IS BACK AND GARSON’S GOT HIM’ followed by THE HUCKSTERS which was another “soldier home in transition’ film this time with Deborah Kerr. 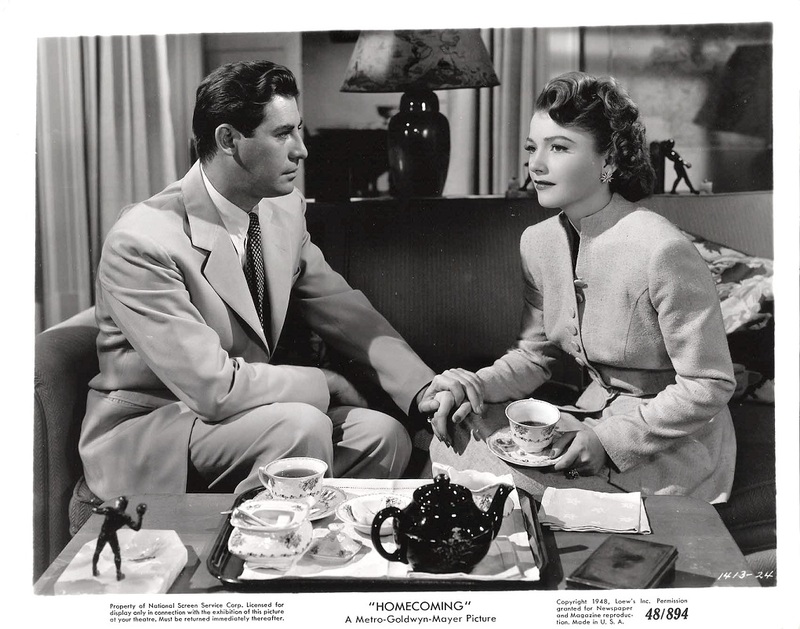 The main difference from all of these previous pictures being not quite successful or fulfilling for some is that HOMECOMING (1946) is not an action picture but one of the heart. 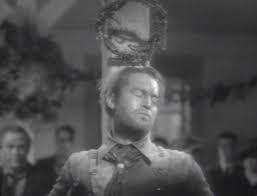 I suggest its cerebral picture much like the thinking in spite of the action, seaU storms and battles that goes on in Gable/Crawford picture STRANGE CARGO (1940). Gable also gets to star against the underrated Lana Turner who worked together in HONKY TONK (1941) with whom he had better on screen chemistry. 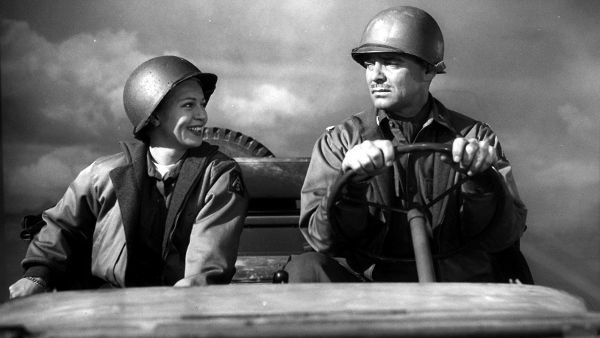 The story is quite simply American Surgeon Ulysses Johnson (Clark Gable) is coming home from the War. As his ship nears the port of New York City the story unfolds in flashback. 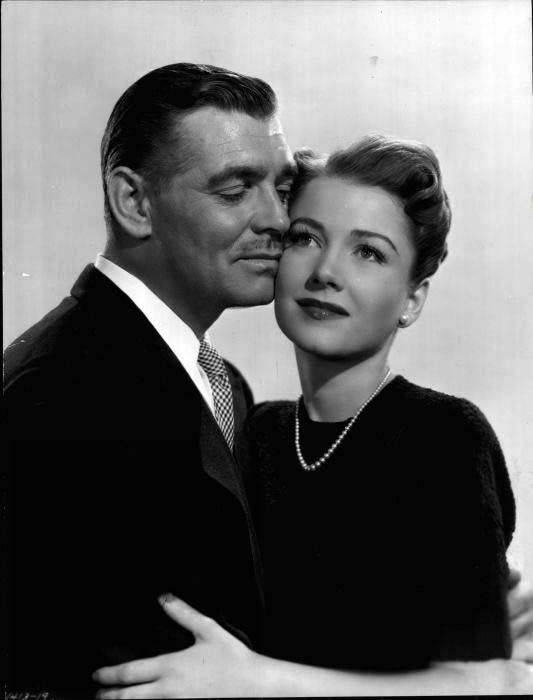 Ulysses is successful with huge house and wife Penny played Anne Baxter. They are childless because Ulysses never thought it was necessary or cared. He is a ruthlessly efficient surgeon who inspite good intentions reneges on promise to help college chum and fellow medical person Dr. Robert Sunday (John Hodiak) with files he wanted a consult on. Sunday visits the Johnson’s residence on the eve of Ulysses leaving for the War only to find his work has not been done. An argument ensues between the two old friends with Sunday accusing Ulysses of not caring for anything in fact going to war because its the ‘place to be”. Penny walks in ending to confrontation. Penny and Ulysses promise not change because of the War as he goes off to do basic training. 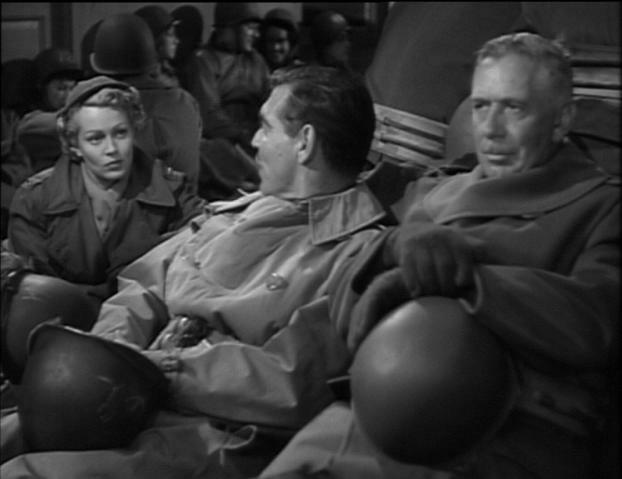 He gets assigned Nurse Lt. Jane “Snapshot” McCall (Lana Turner) and their adventure begins through Europe. The two grow close as want to happen in War yet they maintain their dignity. McCall has a Son who’s Father was killed in China years before. Ulysses writes Penny each night professing his love for his family and telling her of the hard nosed nurse. McCall even give Johnson the nickname of “Uless” in fun. Of course the inevitable happens and sparks fly but for all the right reasons and with dignity. The picture features a lightly naughty but fun bath sequence in which McCall asks Ulysses and Lt. Col. Avery Silver (Ray Collins) to have a bath with her at near by Roman ruin. Avery begs off and both Ulysses and McCall go it alone with some amusing results. McCall gets reassigned as per regulations. They finally kiss in the doorway of Ulysses’s tent with Turner walking into the background in a brilliant shot very reminiscent of GONE WITH THE WIND (1939). Johnson gets leave in Paris where he meets McCall again by chance who has yet to be reassigned. The two head off in the Battle of the Bulge where they work together again. They grow close but he ‘belongs to someone else’ and their affection is unspoken till one night as they are surrounded at Bastogne when they both sadly reveal their feeling. The affection come out with words and gestures and almost a poignant admittance to their Love masterfully handled by both Gable, Turner and the choice of shots with lighting. The story changes and people change. How can one not be changed by the experience of war of operating sixteen hours a day, watching people die including personal friends like Monk (Cameron Mitchell)who delivered the Johnson’s laundry now Sgt. Monkevickz who asked Johnson to look at him before he left for the War. Canada makes it into the film when Monk (Cameron Mitchell) say he is going off to fight in the Canadian army because they are fighting now much to the belittling of his choice by Ulysses Johnson. 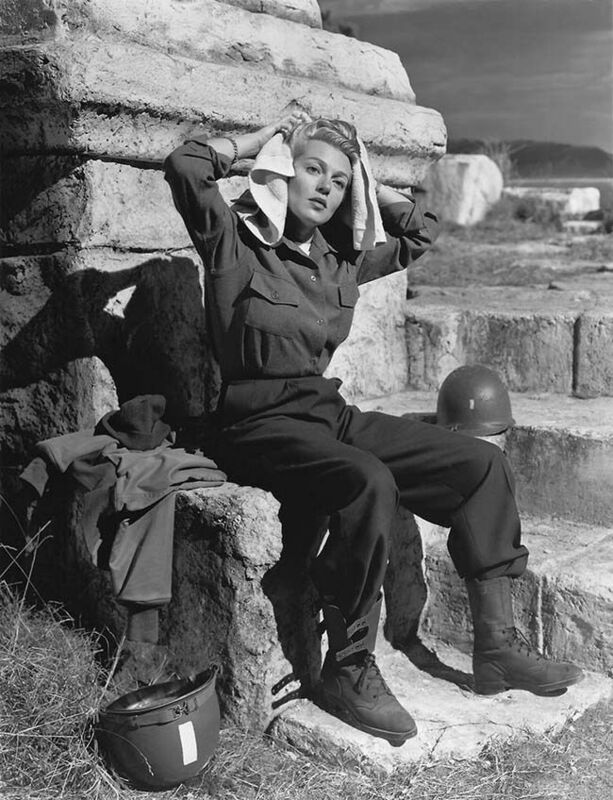 Lana Turner is wonderfully sensitive as the not so glamorous Nurse Lt. Jane “Snapshot” McCall. It is never explained why her character is called Snap Shot by all in the film perhaps it is her cool efficiency which her character shows in operating room situations. 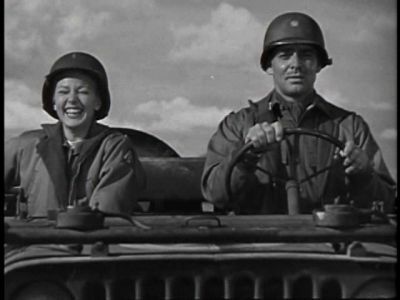 Turner does well in military clothes as she did before in the KEEP YOUR POWDER DRY (1945) in which she was a motor pool mechanic complete with grease. This offers Turner an chance to do what she did for years like no other and that was shed small tears very slowly without moving a facial muscle. The cast is rounded out by wonderful rock solid John Hodiak as Dr Robert Sunday who like his name suggests is the pious center of the picture. Hodiak does well in his moments with Gable as the two spar in great give and take session. Hodiak also offers the shoulder confessor to cry on for Penny Johnson who was played by his real life wife Anne Baxter. John Hodiak when onto an all to brief career in film which is a shame due to his dark intense looks and well modulated tones could have been so much more. Hodiak passed away tragically at age forty one of a fatal heart attack. Life had taken its tole on Gable which is only evident in a sequence in which the lines on his face are evident during a flashback moment of both him and Penny meeting for the first time. Watching film which is supposed to be a ‘World wide ‘ art form one can become centralized on the Hollywood model. 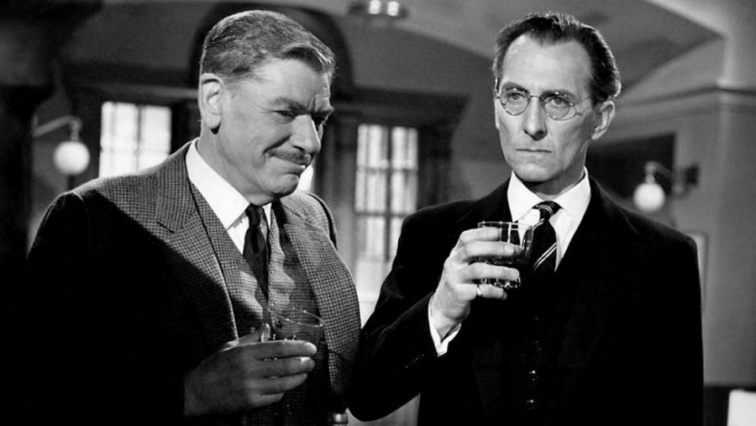 The British have always done a strong job with the spy thriller as long as the maintain their essential “British flavor”. 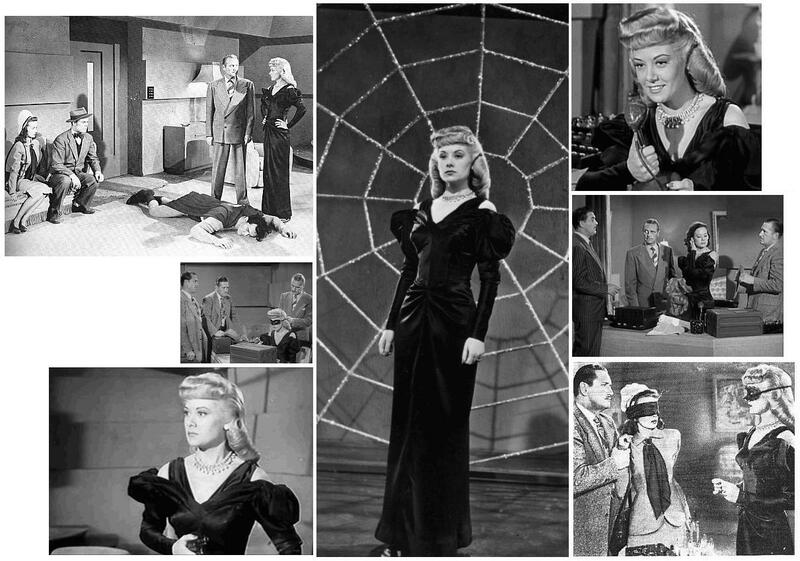 There is a tone in their Television series from the sixties I.T.V series THE AVENGERS to the films like the classic Hitchcock Directed THE 39 STEPS (1935). 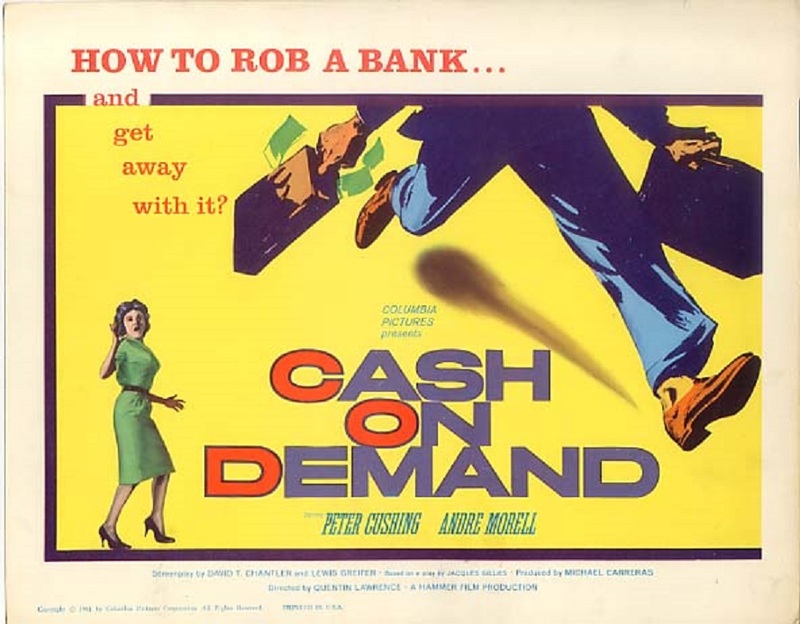 CASH ON DEMAND (1961) is perhaps not in the same cinematic league as those yet is is a refreshing excursion into the heist film. CASH ON DEMAND was produced by HAMMER FILMS and distributed by COLUMBIA PICTURES in 1961 which was the same year as the initial James Bond offering DR. NO. HAMMER FILMS was getting notice for their remakes of Horror films and sequels that splashed color, gore and sexuality on the screen. The studio also did a series of pictures dubbed ‘Physiological thrillers” by the names of CRESCENDO (1970) , TASTE OF FEAR (1961) plus others. These starred as would most of the early Hammer productions the same troupe of actors usually with a choice newcomer or big name sprinkled in sometimes an American for marketing purposes. Black and white films are always a favorite with me and CASH ON DEMAND does not disappoint in that department. Plot wise we have a story about the perfect crime of a theft of 97,000 pounds sterling from the a city bank in a small town during a snow storm. 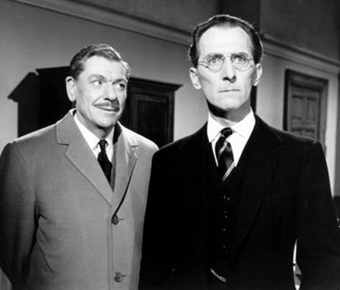 The star of the picture is Peter Cushing who plays Bank Manager Harry Fordyce who is menaced by Andre Morell and Col. Gore Hepburn. Hepburn masquerades as a bank insurance person come to test the alarm system. 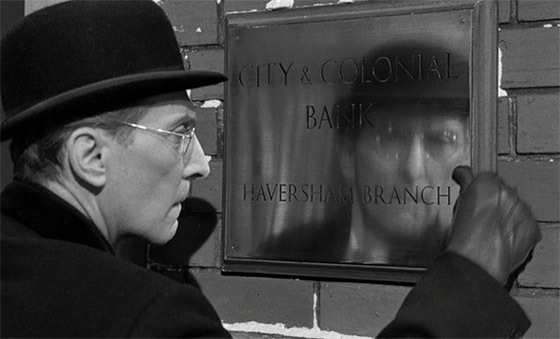 The initial glimpse of Peter Cushing as Fordyce brings that stylised ‘British flavour’ forward as he brushes off the banks outside sign when comes into work. He is ruthlessly efficient and cold towards his staff as he asks one of the women to remove her Christmas cards from her desk as they are not ‘Dignified.” He dresses proper in conservative style with limited body movements and speaks in clipped tones. This a man who is in total control of his world which is the bank, knows his job and his and other peoples place in the scheme of things. The world of the Bank is turned upside down when Hepburn reveals his true intentions plus he has kidnapped Fordyce’s wife and daughter who will be killed if they do not succeed. Fordyce must keep this secret from his staff as he goes about the alarm check and other duties. Morell and Cushing do some excellent verbal sparing through out all the while with Morell’s character holding the ace of having control of Fordyce’s family. The staff that Fordyce rules with managerial coldness learn of the plot. Fordyce begs them to do nothing because of his wife and child however the wheels have been set in motion. 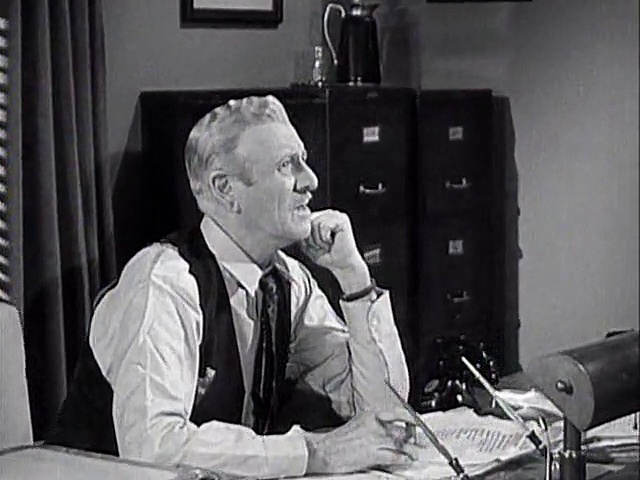 The terrified bank manager must endure a police visit Detective Bill Mason (Kevin Stoney). 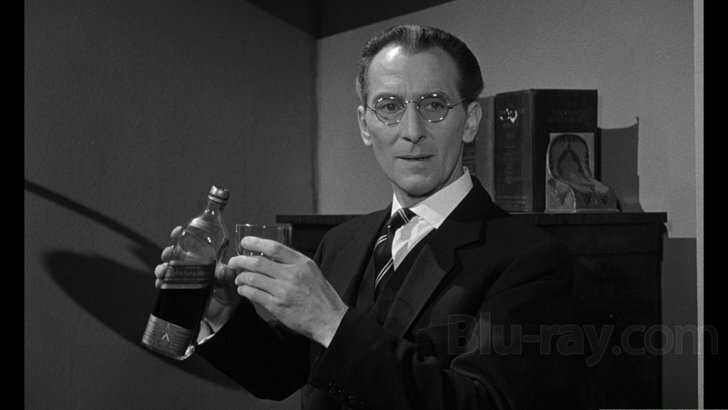 Tension abounds with little bits of business between the actors which Cushing was famous for developing himself. Little quirks of character like the lighting of cigarette or pipe and drawing on it in a special way. The placement of desk items in easy reach for a moment. One also takes tea differently if on is a manager at a bank then the usual person. The pivotal physical turns when he spins to face a adversary are all different each time these are all hallmarks of actor building character which is to often not seen or a lost skill. CASH ON DEMAND (1961) features taunt writing by David Chantler and Lewis Griefer keeping the dialogue down to size and short direct scenes. Director Quentin Lawrence who actually performed the same function on the original television adaption of this story called THE GOLD INSIDE’ for program called THEATER 70 keeps the action rolling and the setups to a minimum. Action is in shot inside the Bank plus outside on the street in the snow all in glorious properly photographed with shadows black and white. CASH ON DEMAND (1961) runs sixty six minutes in original form pumped up to eight nine minute late on. It seems like a hard picture to find on networks yet it is well worth solid film making on budget with good characters and a story. 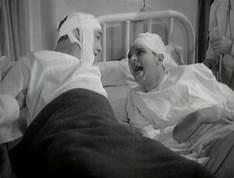 Love to drift back into pre code dramas of all types from the “Dangerous Horrors” of THE MASK OF FU MANCHU (1933) to the Warren William pictures so this trip into the hospital world of EMERGENCY CALL(1933) was looked forward to. Lets step into the waiting area, grab a hard wooden bench for seat and enjoy. 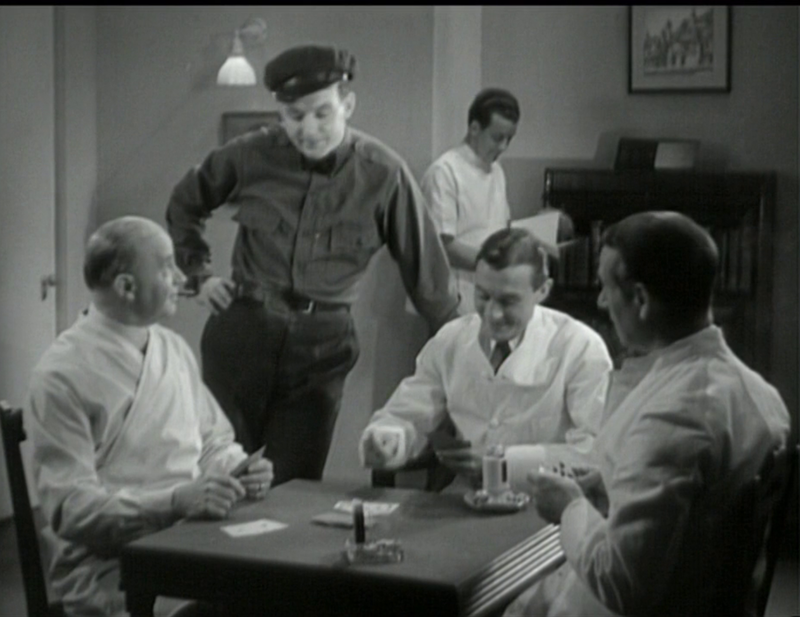 The aspect that these films bring is that they are so delightfully subversive in the medical world following in the “white shoes” of MEN IN WHITE (1934) with young Clark Gable to Barbara Stanwyck’s bow in NIGHT NURSE (1931). These picture became a genre unto themselves as the DR KILDAIRE and DOCTOR GILLESPIE series later BEN CASEY plus many others. EMERGENCY CALL (1933) Directed by Edward L. Cahn for RKO studios combines the world of romance with crime. I suggest that the romantic elements were to keep the women interested while the Crime was for the males interested in the two fisted action. Bill Boyd plays the role of Dr. Joe Bradley who is about to marry into the family of the man who runs the hospital. Bradley wants to prove himself yet is rather naive sort of fellow even forgetting his kit on his first emergency call with Steve (William Gargan) . Bradley even goes the wrong way in the building when he arrives as he learns from Steve in a rather cruel by today’s standards way that all patients at this time’ are at the top of the stairs and weight three hundred pounds”. Gargan in the role of Steve is good counterpoint in the action between Bill Boyd’s style as he wisecracks his way by being street wise and familiar with the other lowly medical people. 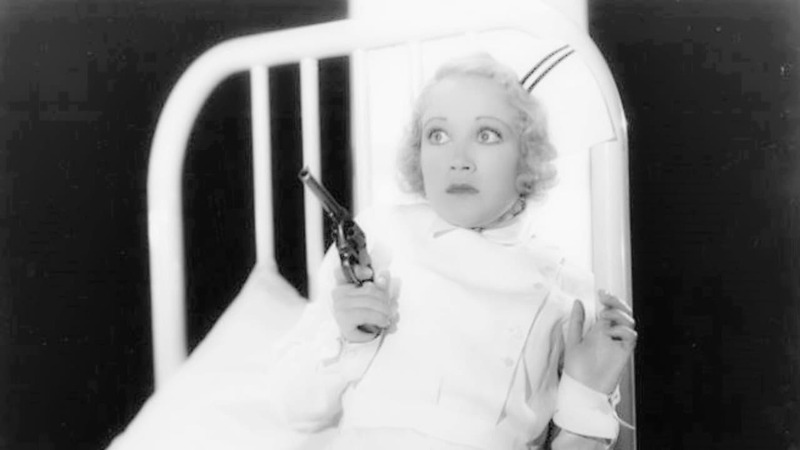 The thirties featured snappy dialogue between men and woman and this is not exception at Steve set up a romance between himself and Mabel (Wynne Gibson). There is fun words exchanged when Steve calls Mabel by the name of Wiennie which she dislikes and asked the matron not to call her that. The matron dresses down Steve who should be spending more time on his work and less with the flirting. Good moment when Steve says ‘hey I only want to marry the girl”. The matron turns to leave and you can see a funny smile on her face. These light moments work well as the story turns up the crime elements as the hospital becomes a haven for “ambulance chasers” and ” insurance scammers” run by the underworld in the person of (Not FANTASY ISLAND.) Mr Rourke (Edwin Maxwell). The racketeers set up accidents with there own people by tossing themselves in front of vehicles to collect damages. 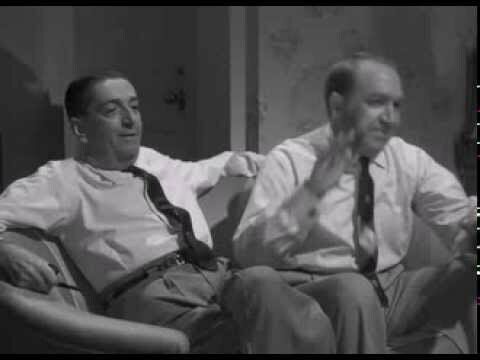 One such person Sammie (George E Stone) is recognized by Steve as he is being brought in and is harassed by him resulting in Sammie leaving the hospital much to the surprise of the head administrator who fires Steve and Mabel on the spot. They are both reinstated and which when the romance between Steve and Mabel blossoms into being asked and accepting of a date. Bill Boyd who is actually billed ahead of all the cast had a huge career before this picture which was made just before his career took off ina role he would be identified with that being the two fisted pure action hero HOPALONG CASSIDY in 1935. 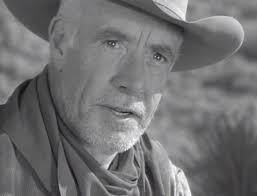 Boyd would go onto play “Cassidy” in sixty six films and short lived Television series Boyd does well in the role playing it low key and righteously naive later in the action sequences his fists fly against the villains. Elevators go up as the fights get multi leveled even rescuing his buddy Steve who is knifed from behind. 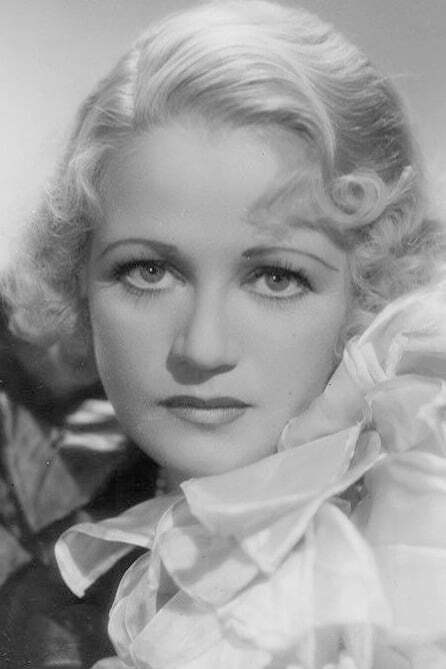 Wynne Gibson had the blonde precode look about her very similar to Miriam Hopkins in face structure and body type who had many famous roles in pre code times such as (With William Gargan) THE STORY OF TEMPLE DRAKE (1933) and DR. JEKYLL AND MR. HYDE (1931) with Fredric March. 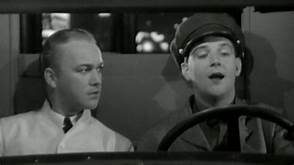 Wynne plays the comedy well in EMERGENCY CALL (1933) plus shift well as the story changes to dark overtones and tragedy. The character of Mabel makes a interesting if not self righteous journey at the end of the film but that was the style for the time. It is nice touch that the name “Wiennie” which she does want to be called in the film is similar to her real first name. Disturbing moment in this film occur when Steve continually calls Mabel ‘My little Wiennie” on the date culminating him him holding here close and slapping her three times saying the name making Mabel cry. Steve then says ‘Now that”s settled’ and the date continues without incident. 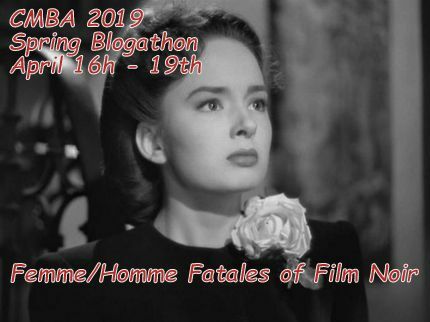 This was not as bad as the moment with Joan Blondell in SMARTY(1934) which is filled with references of women loving to be hit by men even the point of ‘Liking it”. Two sided comment of the state of relationships and the way Hollywood saw the institution of marriage which had to be upheld at all times yet allow for violence in the name of preservation. The rest of the cast rounds out well from the contract player at RKO with villians being tough a large physically and meek when they have to be. 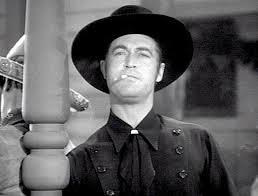 Paul Fix who had large and distinguished career in Westerns, Crime pictures and later even as “Dr. Piper” who was the precursor to “Dr.McCoy” in the second original Television pilot of STAR TREK has a brief role as Dr. Mason. 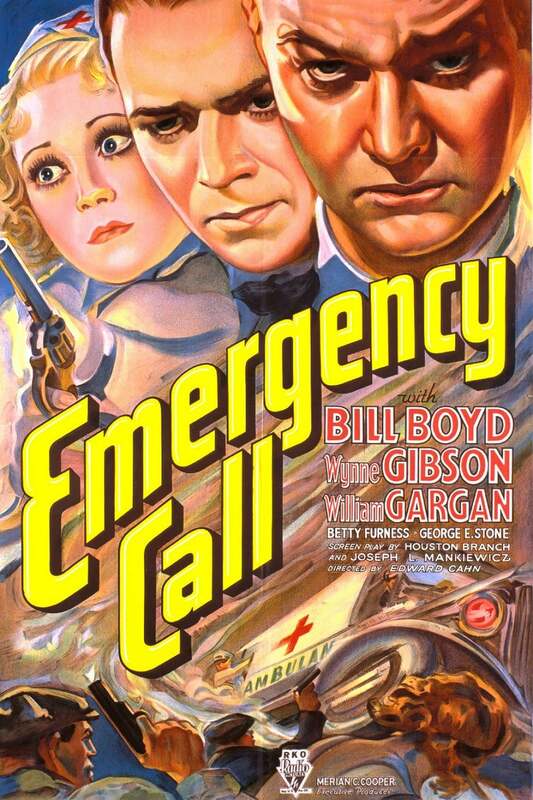 EMERGENCY CALL (1933) paces well into it running time sixty five minutes. It features early screenplay credit for Joseph L. Mankiewicz who went on to do a few other good things in Hollywood. For some reason it is hard to find picture which can happen as well all know yet it gives one a chance to see Bill Boyd before he became William Boyd and began riding horse on those dusty trails. I don’t mention Westerns very much since honestly I don’t see many with exception of STAGECOACH (1939), THE SEARCHERS (1956), THE WILD BUNCH (1969), both versions of CIMARRON (1931) plus (1960) and the Clint Eastwood Modern classic THE UNFORGIVEN (1992) plus a host of others. I do watch more than I think they just don’t appear make me want to explore it as much I do as much other styles. This middle remake the THREE GODFATHERS (1936) struck a chord with me begging me to mention it. 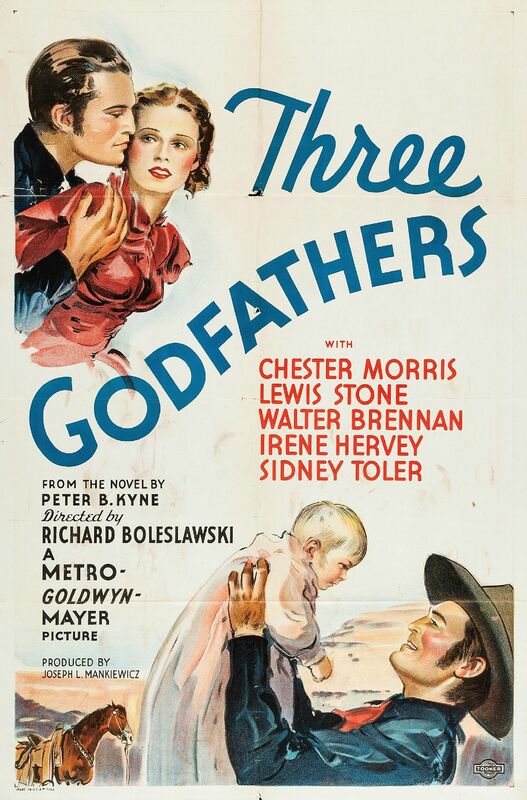 This THREE GODFATHERS (1936) edition Directed by Richard Boleslawski is the remake of the John Ford 1916 version of course to be later tailored for John Wayne in Technicolor in 1948. 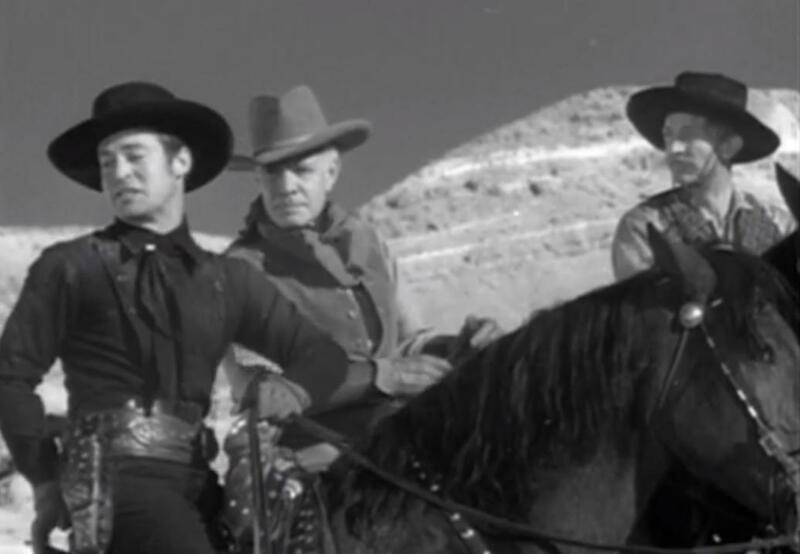 The Western genre is one of the few that works effectively in black and white or color. The non color adds to claustrophobic style allowing one to better concentrate on the actors. 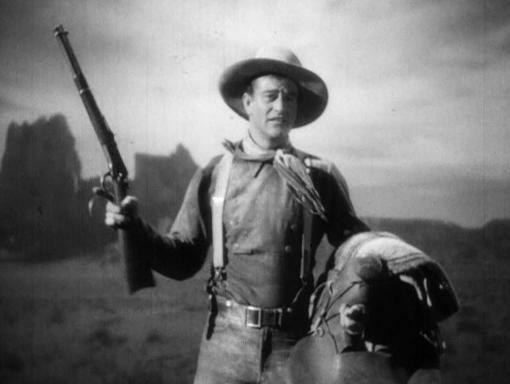 An intimacy with the film and the audience with an example of John Wayne’s bravo first Hero shot with his gun upraised and saddle by his side in STAGE COACH (1939). This is a film hero larger than life and get ready for a story. Technicolor added the vistas and natural beauty which also let well to the telling of the stories against a broader canvas. The picture’s story does’t really change as one find Three bank robbers finding a wagon containing a dying woman with a child with whom them pledge to take care. Leaving out the biblical parallels of three men, wise to the ways of the world, wandering in the desert with a child you get a story of perseverance and self persecution. 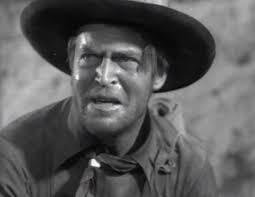 Lewis Stone who would go on to be known as Judge Hardy from the ANDY HARDY series gets a turn as a grizzled gun fighter James Underwood who is worn by age and memory. No matter how you try to disguise Stone’s voice those tones come through particularly when the “Shakespeare” sequence. Stone has long and varied career with many styles of roles yet this picture shows him a sad person filled with life to the point of being like Roy Batty in the rain on the rooftop from BLADERUNNER (1982) remarking that it is ‘Time to die”. 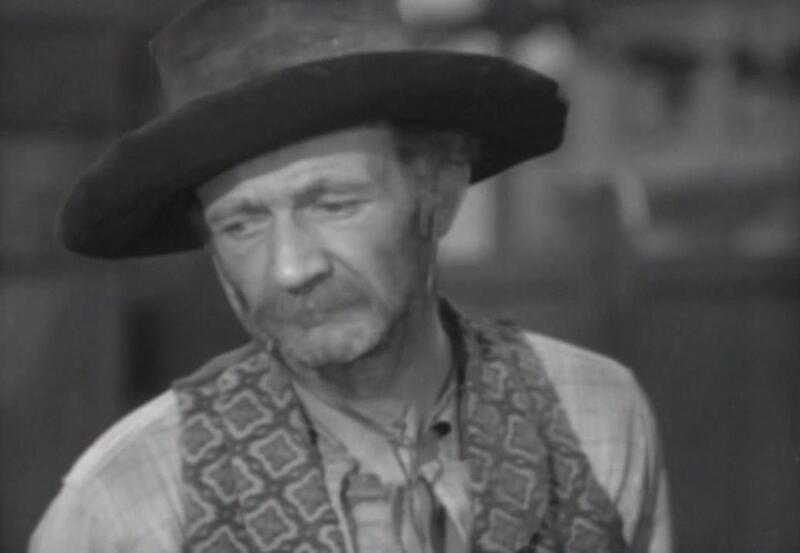 Walter Brennan gets what proves to be his life long role he would do variations of as the not so intelligent yet sincere Sam Bartow. Underwood and Bartow have an strange affinity for each other as they hint at the past. Bartow hints that Underwood was to tell him about a packet of letters he has been carrying a round only to see them burned. The both act as confessors for each in the desert as the journey continues. 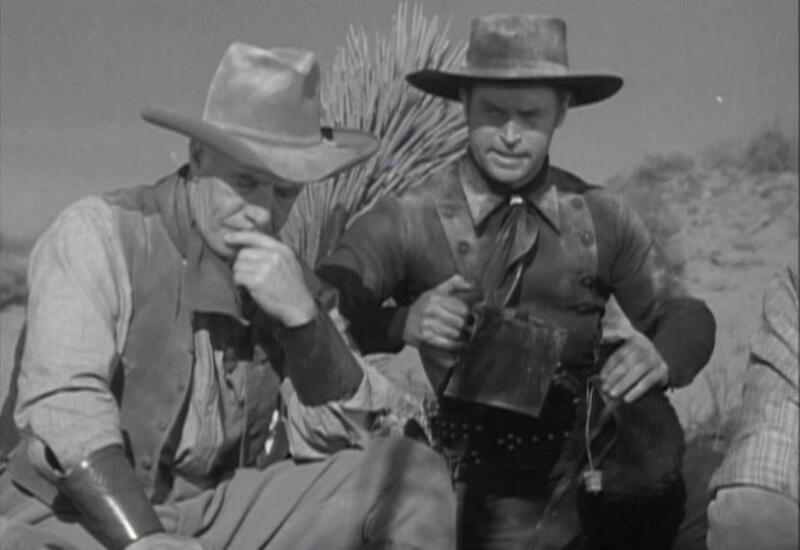 The two also act a buffer between the baby and the tough, black clad leader Bob Sangster played by Chester Morris. Barstow and Underwood take a more active role in the care of the child giving it their ration of water and limited food which Sangster will have nothing to do with. Chester Morris was one of those that I and a few others refer to as being from the “Lyle Talbot School of Acting’. Lyle had the good looks, the voice, a variety of roles yet for reasons unknown was never thought of as a “Star”. They would have streaks of success as Morris had with “BOSTON BLACKIE” series of films and radio adaptations. Morris would get to play against the likes of Jean Harlow in RED HEADED WOMAN and Wallace Beery in THE BIG HOUSE in the thirties. Morris later drifted into smaller roles obscurity of B films and television . Bob Sangster is hard and nails bank robber who is first against taking the child. He lets Underwood know he should get rid of the books he salvaged from the wagon. He is also more action oriented then the other two as it is Sangster that find the horses gone and does his level best to find them. 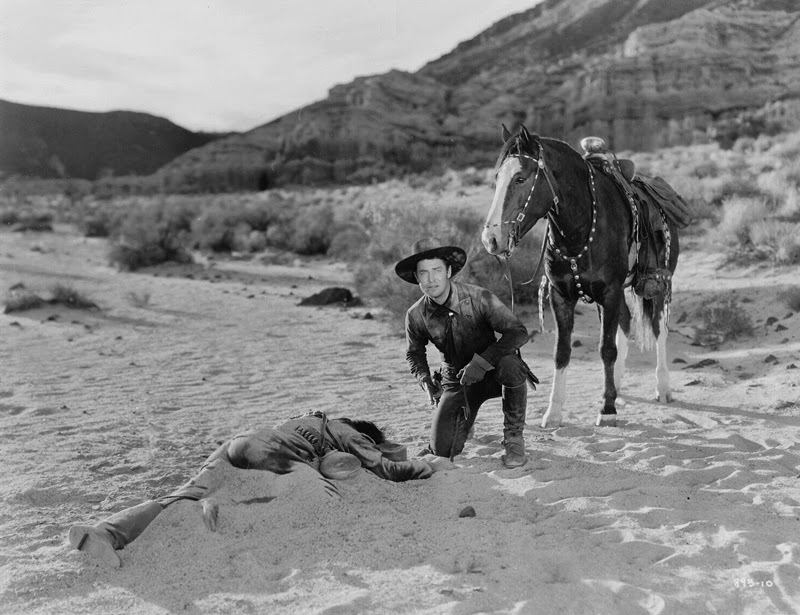 One harrowing moment features Chester Morris as Sangster abandoning the child several times only to turn back as the child is crying and discharge his gun. 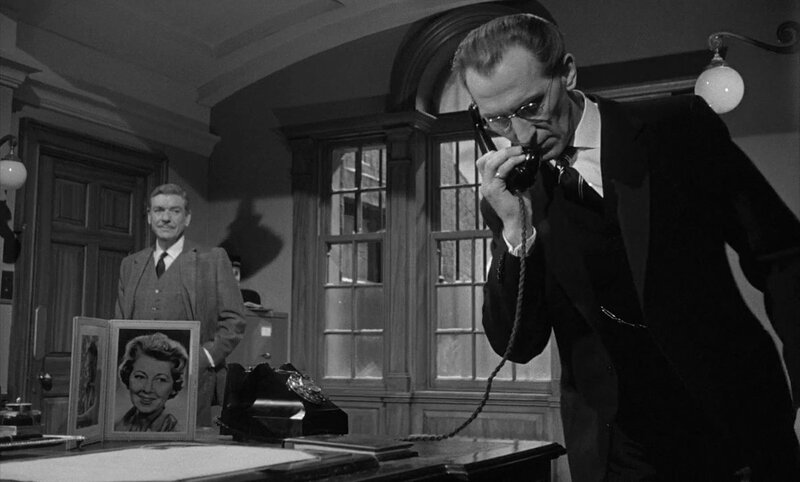 The camera lingers on the desperate, dirty, Sangster and when the child falls silent you thinks the worst. The picture then cuts back to a calm baby and a dead rattlesnake beside him. Sangster sling the child up and continues into the desert. THREE GODFATHERS (1936) makes good use of the scenery as the desert looks dark and foreboding at night and a bright, scotched hell kitchen in the daylight. 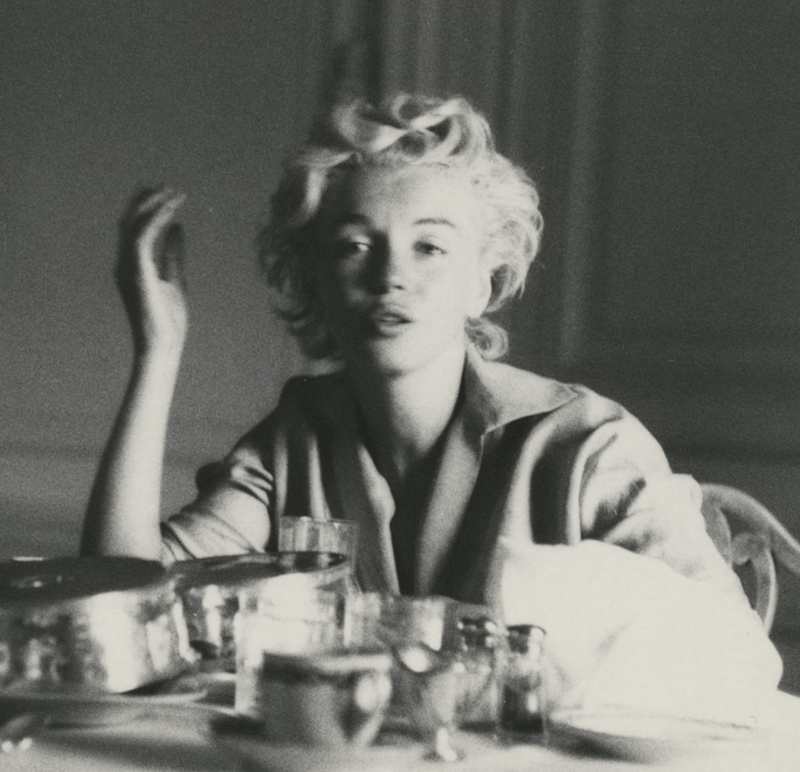 Sound is a strong suit as there is often an absence of it with exception of dialogue and slight music particularly in on moment featuring a single gun shot. The vast empty dusty world figures strongly as one morning Sam Barstow strides through the sand to his destiny. Western Religion fills the screen on more that one occasion in subtle and not so subtle ways which fit what the studio being MGM has to do for the story to get passed the censors and the Catholic Legion of Decency. Today one may scoff at the control these groups had yet in the thirties in Hollywood a studio could not afford to have a picture destroyed at the box office. Real power was within these groups to forbid people to not see a picture which they often obeyed. 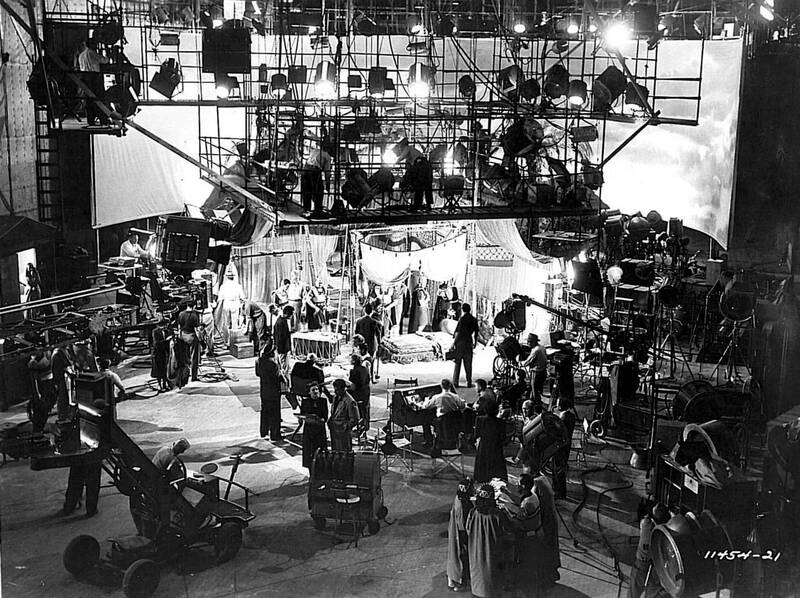 THE GODFATHERS (1936) features Mojave Desert locations which must have been novel for the actors and difficult for the crew. One can imagine Klieg lights, makeup running, in the desert plus the assorted wild life without today’s facilities. 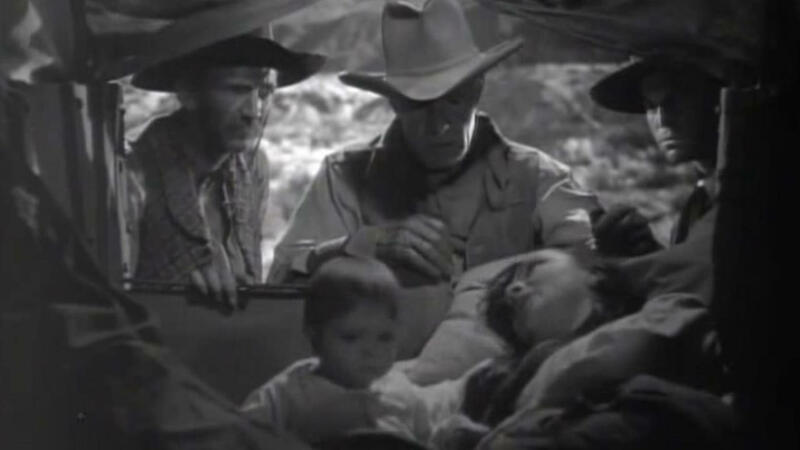 The picture also features a look the three aspects of ‘family” from the action male or father played by Chester Morris to the dutiful son by Walter Brennan and the the nurturing mother by Lewis Stone. The family is set up to fail because it is not traditional and all order must be restored through a return to a proper family by the “Grace of God” Still it is an interesting “buddy’ film to see.